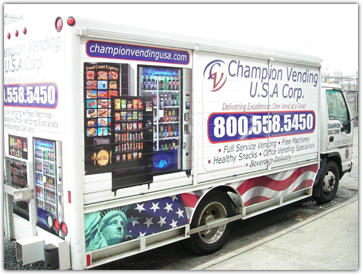 Champion Vending is a Brooklyn-based family business that has grown in 22 years to become one of the largest providers of full-service vending in the metro area. Our unparalleled relationships with bottlers and manufacturers mean that we can package special deals at better prices and offer higher commissions to our valued customers. But our real strength lies in our service and with our relationships with our clients. 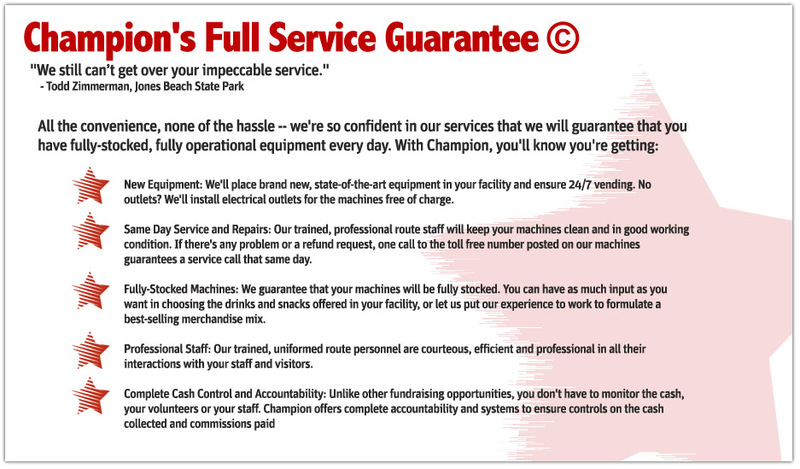 Alone in the vending industry, Champion Vending doesn't bind our clients with long-term contracts. In fact, we don't offer contracts at all. 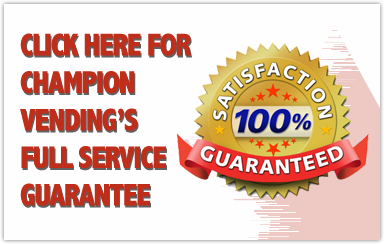 But we keep our clients month after month and year after year through our attention to their need sand our unique Full Service Guarantee©. For over 22 years Champion Vending has been the exclusive vendor to schools, state parks, and major companies in addition to being a Sodexo partner in the New York Tri-State area. We have a team of long term employees who have served with us for a minimum of 8 years. Our employees are very knowledgeable and reliable who work together to give you the best customer service 24 hours/7 days a week. Educational Programs Allow Champion Vending to serve the needs of your school. We understand the complexity behind on-campus and school vending. We take every measure to ensure that student access to beverages and snacks meet federal, state, and local laws and guidelines. For more information on a healthy refreshment program for your campus please do not hesitate to call. Champion Vending offers a wide variety of healthy products and we are continually striving to find more products that fit a healthier vending program. Call us toll free at (800) 558-5450. Join our growing family of satisfied customers today! The more you learn about Champion Vending the more you'll understand why Champion Vending is the premiere healthy vending company in the New York Tri-State area.